Now that I had a big rough continent map made with my cheap watercolor and pencil techniques I was ready to begin adding some type of form to the elemental crayola chaos. I didn’t want the players to be flying across continents on the backs of eagles quite yet, so I needed to bring my focus down to a smaller region of the map to begin to pick details. I knew that the area covered by the Wilderlands Of High Fantasy maps in the Judges Guild publications could roughly fit the surface area of New York state (275 x 167 miles in hexes). This helped me to zoom in and pick a spot on the coastline of my rough map that looked nice. The spot had a lot of green, a coastline, and some splots of gray for mountains. A nice variety of land to travel but nothing too crazy on the map, I would save my red leaf tree forests for later. 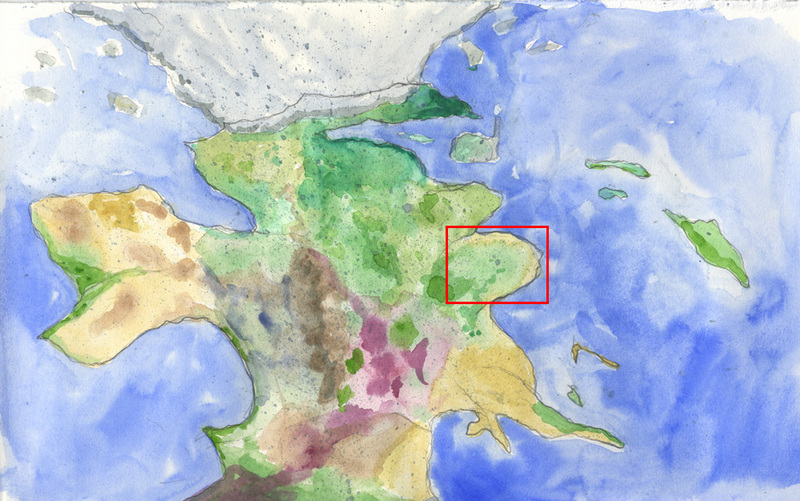 So I moved into the digital realm and scanned my painted map with my desktop scanner at a high resolution. I set it at 600 dpi because I knew I would be zooming in and I would rather the map details be the tooth and texture of my paper rather than the resulting pixels of a low end scan. I then opened the image file in GIMP and prepared to select my region map. To do this properly I needed to have my region map overlay so I could pick just the right rectangular box of my painted map that would fit my hexes. I needed to find some way of making digital hexes. My quest was resolved when I found the excellent Boardgame Extensions for Inkscape written by Pelle Nilsson. If you did not know, GIMP and Inkscape are two free software packages that are used for editing digital image files. GIMP is for raster graphics and Inkscape is for vector artwork. The Boardgame Extensions in Inkscape allowed me to generate a hex map that was just the right size and with the right numbering sequence. It just needed a little graphical tweaking to make it look like a simulation of a Judges Guild region overlay. Here is a zip file of the vector and raster hex overlay to use for your own map. 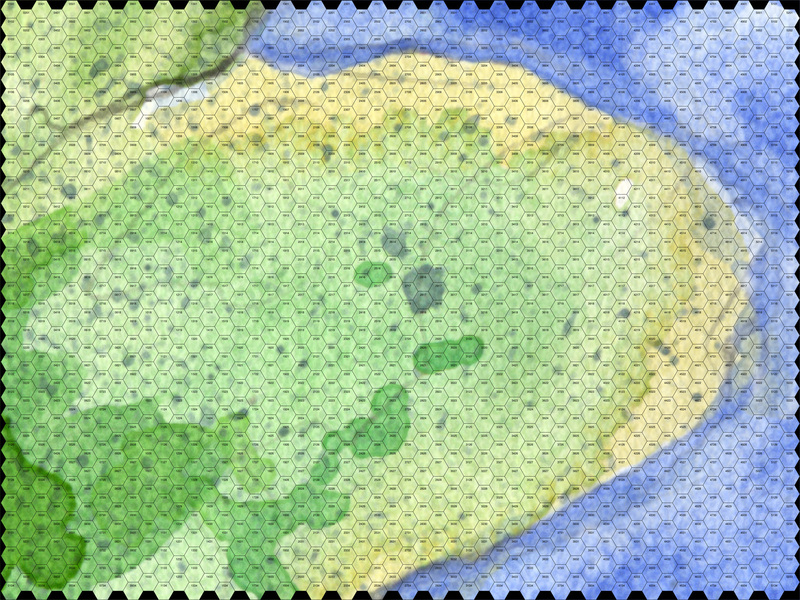 I then selected my now reduced region of the map and used the Layers function in GIMP to place my hex overlay over my painted section. You can adjust the opacity of the images and change the way the layers interact (multiply) to have only the black of the hexes visible. This way you could have as much or as little information on your map as you want. One layer for roads, one for villages, etc. It’s awesome to know that the Wilderlands region is the size of NY State! I’ve heard that Bob Blesdsaw had an awesome techno-magical explanation for why it spanned so many climate regions, but if this has been recorded for posterity I don’t know where it is. The geography is reasonably realistic-looking; did you do any worrying about rivers flowing uphill and wind patterns depositing rain on one side of a mountain or that kind of world-building, or did this just emerge from the same sense of looks-like-other-maps-I’ve-seen rightness that I rely on? I think the whole Wilderlands = New York State dovetails nicely with some of the concepts around our Gamma Jersey game. It asks the question how far a party’s range is if most of the time the PCs are walking or sometimes have horses. The mapping was done splotty at first and that makes for nice isolated mountains and forests around the gray and dark green colors. But mostly it was going slow in the finish up phase and the color choices after the splotting. I don’t think I ever really think about a rainshadow region unless I make a giant line of mountains somewhere. Rivers are easier because you can just see where river inlets are formed with the deep jags on the coastline. The northern part of my region map for example. Other smaller rivers get drawn in after I place the mountains. I just gather streams at mountains and draw them down through flat areas until they hit the coast. The random encounter placement of large villages also tells me where the rivers should flow because of the pseudo-medieval propensity for civilized settlement close to water sources. @James and sea travel: this is why I will be lining up extra early for Corsairs of Medero at Recess. I was reading Wizard of Earthsea the other night and was thinking about the map of the Archipelago. Maybe we are subconsciously aware of the fact that we know absolutely nothing about the realities of sea travel but we can safely dream away the realities of running a sword through a Gnoll. Maybe it’s Tolkien’s map’s fault. Maybe its the relative straight curves of the North American coastline. The Idyllic Isles tables in the JG books look like they would be a blast for a sea going campaign though. In the game I’ve played in where sea travel versus land travel was most explicitly considered, the key was that there were trade-offs. We were playing in a lightly fantasy version of the Roman Empire, and we needed to travel from Britain to Rome. As a group that included several Roman elites and with substantial combat ability, overland travel was relatively safe but slow, whereas any sea travel (even just across the Channel, but especially if we went around the Iberian Peninsula and through the Straits of Gibraltar) would be faster but more dangerous. So we chose a middle route, crossing the Channel then traveling on the Roman roads to Marseilles and then taking a short voyage across the Mediterranean to the principal western Roman port (whose name eludes me right now). If we had more time, we probably would have made the entire trip (excluding the Channel crossing) by land, but if we were even more pressed, we probably would have made the whole trip by sea. Is there any chance I could get you to email me your ‘zip file of the vector and raster hex overlay’? It is no longer on Rapidshare. Wonderful series. I played the original D&D and AD&D e1 back in 1980-85. Looking at the e4 rules today is, to me, like reading a foreign language since I haven’t kept up with it. Recently a friend expressed an interest in learning to play so I dusted off the old Basic and Expert set, dug out the dice and am now (for the first time) trying my hand at mapping on the computer. Because my nature is Chaotic, I support thread necromancy.